Whilst many countries throughout the world can be said to be fanatical in their love of and dedication to cricket, others have no clue about the rules at all. 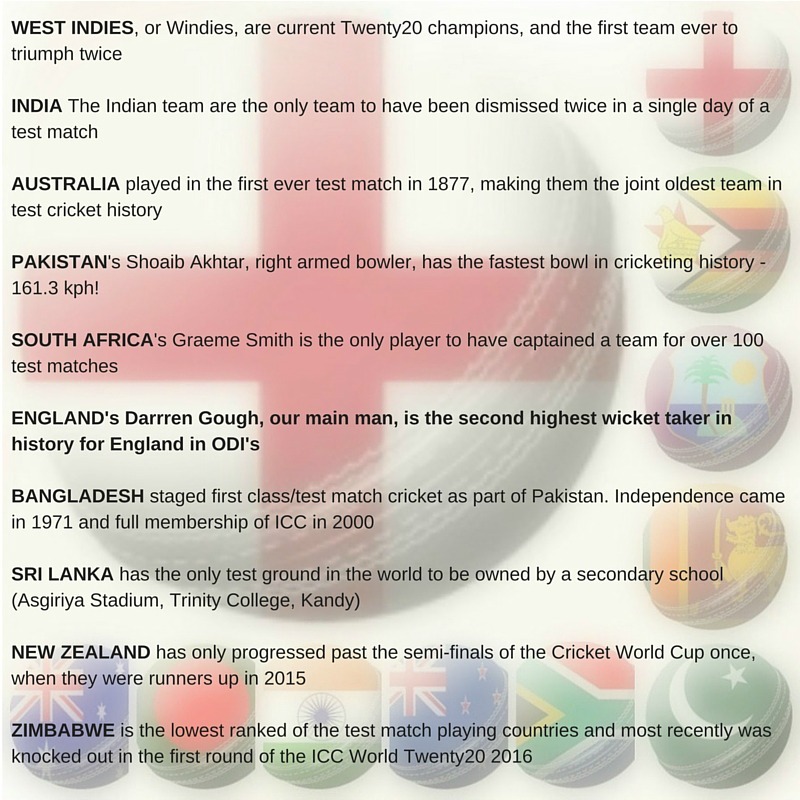 We took one favourite fact from each of the 10 test playing countries to share with you. So, with rain guaranteed not to stop play at Lords on 21st, why not dust off your cricket whites, bat and pads? The experience includes a cricket coaching session with Darren himself, alternating between batting and bowling in the nets, with use of an automated bowling machine ensuring deadly accurate balls each time. Goughie is on hand offering hints and tips to help guests improve their techniques. And according to Martin, he was really friendly and happy to jump in and get involved. Team up to play a real indoor game (you may even get a chance to bowl to the great man). It doesn’t end there either. After the game everyone showers and changes ready for a personal tour of the grounds, and the group head behind the scenes at Lord’s with a guide giving access to a number of exclusive areas including J.P. Morgan Media Centre (boasting the best views of the field), the famous Lords Museum and both changing rooms. The experience ends on a high with a sit down question and answer session with Darren and a piece of signed memorabilia to take home each. If that isn’t cricket, we don’t know what is. Book now to secure your place!